Latex-free adhesive that's part of Salon System's Lashlift system. 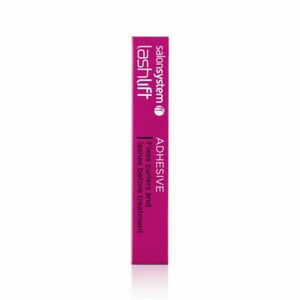 Salon System's Lashlift Adhesive comes with an applicator for use with the Lashlift system. It's a latex-free adhesive that's used to adhere lashes to Salon System's own silicone curlers easily and effectively. It's an integral part of Salon System's Lashlift system that aims to achieve a 'natural look' alternative to the daily use of mascara and mechanical eyelash curlers. £15.60 (inc. VAT) Why no VAT? We're a trade wholesaler and quote our prices without VAT to help our VAT-registered customers understand the true cost of a purchase. A gentle and effective perming lotion in gel formulation that forms the first step of creating the illusion of length and volume for your clients' lashes. Brilliant Lashlift salon kit that has everything you need for 90+ treatments offering a 'natural look' without mascara. Each treatment offers results that will last for up to 8 weeks. Trio pack contains 4 ml each of Lift Lotion, Fixing Lotion and Nourishing Lotion.